← Who is the intruder peeking out behind His Excellency? Under the DAR arch is my daughter, Heather Woodring, recently inspired to join The Daughters of the American Revolution following my footsteps and those of her great grandmother, Nina Rawson Jones, who was one of the earliest members at the turn of the 20th century. 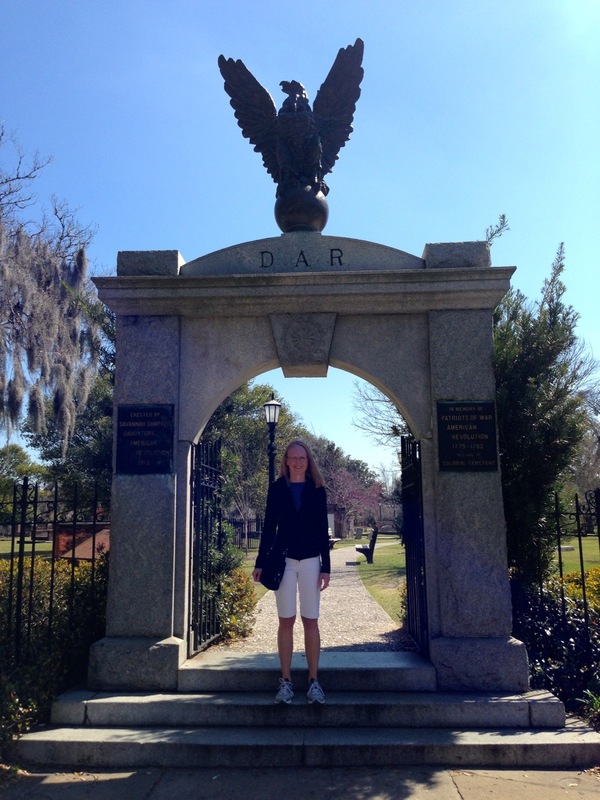 Last winter (2014) Heather visited this magnificent DAR archway that stands proudly at the entrance to the Colonial Cemetery in Savannah, GA. This memorial arch, erected in 1913 by the Daughters of the American Revolution, honors the veterans of the Revolutionary War buried there. If you are looking for the archway, it can be found at the north corner of the cemetery.